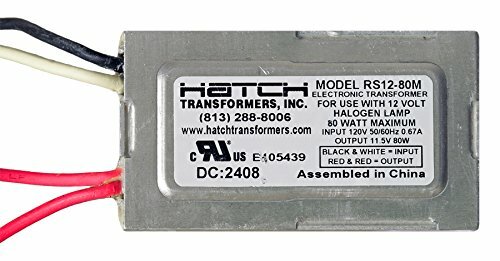 About the Hatch RS1280M Electronic Transformer 80 Watt 12 Volt Output 120 Volt Input The Hatch RS1280M Electronic Transformer features soft start circuitry to ensure maximum lamp life. The soft circuit startup allows the cold lamp to slowly ramp up the lamp filament voltage. The Hatch RS1280M Electronic Transformer employs the Hatch Electronic Short Circuit and over load Protection. The ESP sensing circuit will shut the output down instantly before any of your components experience stress when a short or over load has been detected. The transformers will reset automatically once the fault has been fixed. The Hatch RS1280M Electronic Transformer features 120V input voltage, and 11.5V output voltage.